Buddhist prayer bracelets, otherwise known as wrist Malas, are used by Buddhist monks and followers of Buddhism to guide them through prayer. 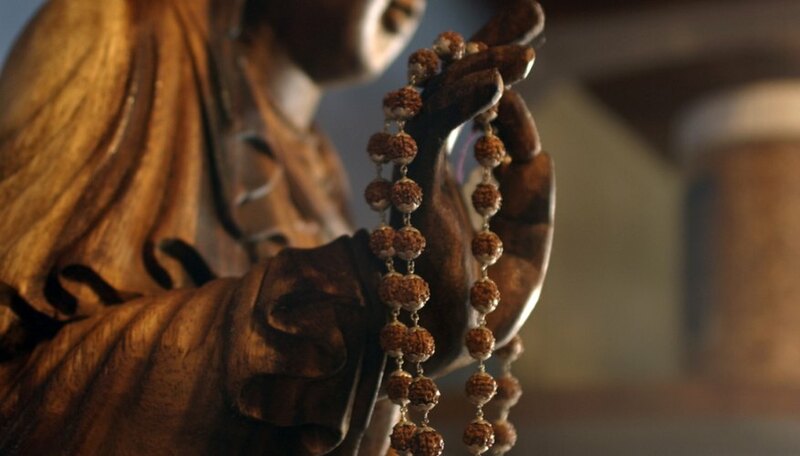 Many designs of Malas exist, but the most common wrist variety features 18 beads, with each bead representing one of the 18 Lohans, or Buddhists who attained nirvana. These bracelets have become very popular as fashion accessories due to their wooden aesthetics and connection with peace. You can make your own Mala with a trip to your local craft supply store. Tie an overhand knot in one end of your 10-inch length of hat elastic. Clean the other end of the elastic of any fraying by holding the flame from a lighter under it to melt the fibers together. Do this very quickly to prevent the rubber from melting and dripping. Feed the 18 wooden beads onto the elastic. The knotted end will prevent the beads from falling off. Tie a reef knot with the two ends of the hat elastic once all of the beads have been loaded onto the elastic. Place the bracelet on your wrist. The elastic should allow the bracelet to comfortably fit over your hand and rest on your wrist without cutting off blood circulation to your hand. Try carving the beads with the tip of a sharp knife to add decoration to them.